I’m not sure the last time I’ve seen President Trump wear a non-white dress shirt. Maybe he’s worn a light blue dress shirt and I just confused it for a white shirt. That’s not a criticism, just an observation. I have no comments about the article other than to say it states her ex-husband’s name is Gail and I can’t recall any males named Gail other than football great Gale Sayers and the fictional character Gale Boetticher in “Breaking Bad” and “Better Call Saul”. While I’m not a fan of Senator Ted Cruz, I hope he continues to keep the beard. 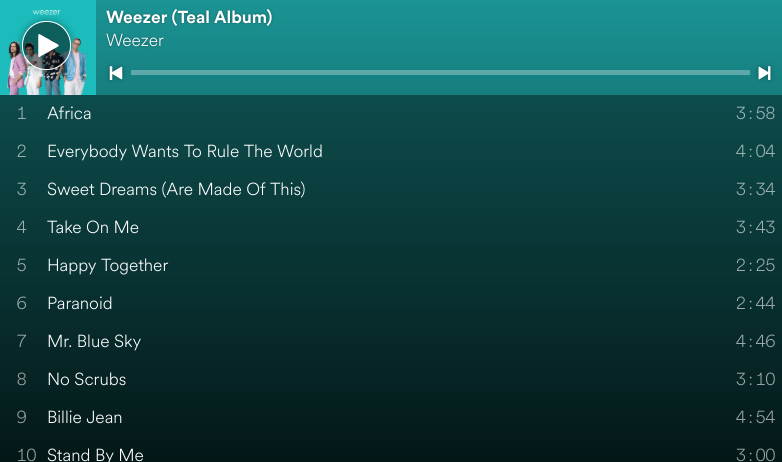 Weezer released a surprise album in which they cover a lot of “classic” songs. Their version of “Africa” has been enjoyable and fun, and after listening to these samples, I’m sold. Christmas is pretty far back in the rearview mirror, but I noticed Fellowship Church in Grapevine toned down the outdoor decorations quite a bit. The kids will be baptized this Sunday. I really appreciated our pastor stopping by the house to have a chat with them, speaking about the tradition and symbolism of the sacrament but also explaining how it is not a qualification or something which makes them extra special (sauce, lettuce, cheese, pickles, onions on a sesame seed bun). In my last post, I made a comment about Texas accents. That has since reminded me about this clip of Fred Armisen discussing and performing Houston, Austin, Dallas, Corpus Christi, and Amarillo accents. The video below should be qued for you. Fred Armisen is a genius. I would agree on the vocals being overwhelmed from time to time. Most of the songs are heavy on the instruments, especially the synthesizer. Two of the songs where the vocals aren’t drowned out at all are ones that feature very little synthesizer, Paranoid and Stand by Me. Overall, it’s a very fun album. I listened a few times over the weekend and enjoyed it. The Tears for Fears song is one of my favorite songs ever, so I especially enjoyed their take on it. On one of the Lucy shows, Mr. Mooney’s real name was Gail (or Gale) Gordon.